RIO DE JANEIRO, BRAZIL – In 2011, U.S. street photographer Gary Mark, Smith accompanied by photo journalist Sarah Stern, entered pre-pacified Rocinha; Rio’s most notorious favela, in order to capture scenes of everyday life within the community. The images were later combined to create Smith’s fifth street photography book, titled “Favela da Rocinha, Brazil”. Smith’s fifth street photography book, titled Favela da Rocinha, Brazil, photo by Gary Mark Smith. 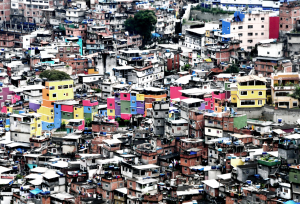 His co-producer, Sarah Stern adds that the community involvement played a big part in ensuring the success of their work, “There is so much pride that Rocinha’s residents have for their home, and we wanted to show that off. By the time we left, we had a lot of love for the community, too. 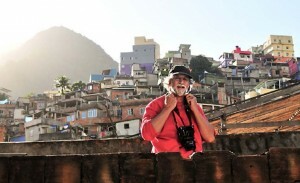 Photographer Gary Mark Smith against the backdrop of a section of Rocinha where he lived and worked during 2011, photo by Sarah Stern. Prior to pacification, Rocinha was controlled by Nem, a drug baron at the head of the Amigos dos Amigos gang. Without police control, the duo faced possible danger, yet they managed to carry out their work peacefully within the community. Nevertheless, the overall experience of the two photographers was that of sheer appreciation and gratitude to the residents of Rocinha who took them in and made them feel completely at home. So much so that Smith pledges a percentage of the book’s purchase price will be donated to provide free art classes for the community’s youngsters. Stern states, “Rocinha gave so much to us, we wanted to give back to a people we all came to love and admire.” To learn more about the book, its creators and how to obtain a copy, visit the website www.rocinhathebook.com.